When Avengers #10 hit shelves last November, it included a mysterious page of showing the potential futures of the Marvel universe. 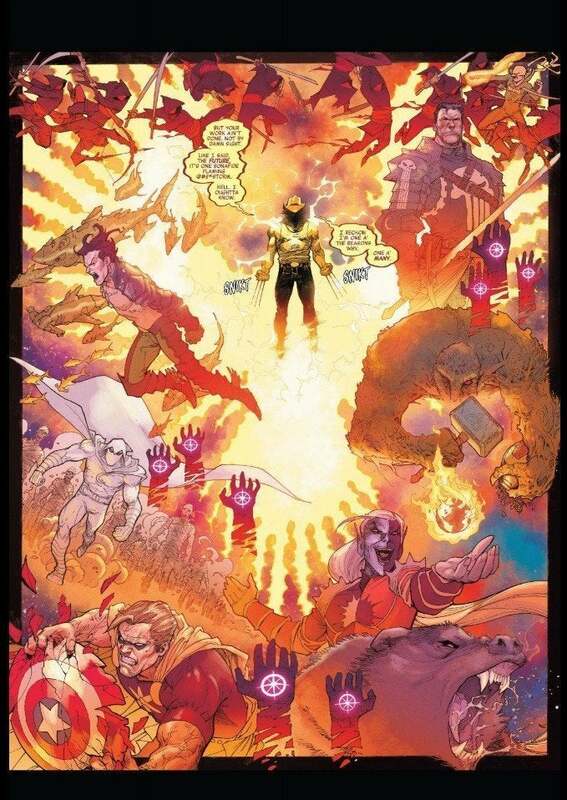 The art includes a plethora of characters in various different situations from Man-Thing wielding Mjolnir to Iron Fist fighting a swarm of foot soldiers in the Hand -- the splash page is chock-full of all sorts of goodies on the horizon. Another character on the page is Moon Knight, who appears to be leading an army of the undead. ComicBook.com had the chance to sit down with Avengers writer Jason Aaron to talk about what's going on with the title. As it turns out, Aaron plans to touch on everything that appeared on that page. "Yes, I do have plans for Moon Knight," Aaron teases. "It's a question of 'When am I gonna slap that in?' That's not one of those first arcs after War of the Realms. I really have a big Moon Knight story I really, really want to do. It's just a matter of when we get to it." Not only is a Moon Knight arc on the horizon, but Aaron says he plans to flesh out everything on that page, it's just a matter of time before he gets to it all. "Everything you see on that tease is stuff we've either already set up or we're looking to set up," the writer continues. "I did the same thing on Thor over the course of years. We did multiple versions of those teasers. I was teasing Mangog five years before we ever got to the Mangog story, so I like putting a pin in things and showing this is literally where we're going. It might take a little while to get there, but I'm not planning on going anywhere for a while, so we'll get to all of them." In addition to writing Avengers, Aaron's the primary architect behind Marvel's upcoming War of the Realms event this Spring. After that, Aaron's set to co-write Valkyrie alongside Immortal Hulk scribe Al Ewing. Avengers #18 hits comic stores on April 24th.